To be successful today, leading brands and corporations must stand beyond making profits. Edelman’s 2012 Trust Barometer found that tomorrow’s trust is built on societal performance through the treatment of employees, putting customers ahead of profits, and investments in the environment, society and local communities. Edelman CEO Richard Edelman called this seismic shift an organization’s need to go beyond a earning a “license to operate” to earning a “license to lead.” A critical way to do this is by bringing society “inside” the organization to gain business and social impact. From Edelman’snew research– measuring 16 markets with 8,000 consumers– they’ve found that consumers report that Purpose is here to stay. Since 2008, 86 % report that companies should place at least equal emphasis on their social interests as on their business interests. 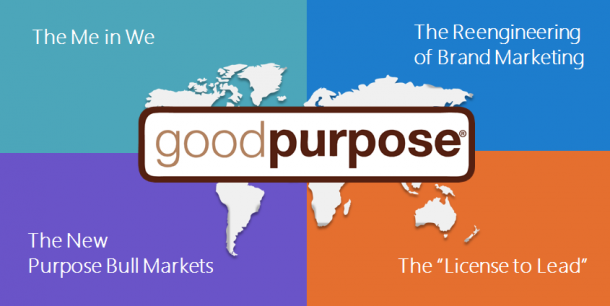 Across the globe, the prominence of Purpose as a purchase trigger has risen 26% since 2008. In certain regions, that growth is even more pronounced: Japan (100%), China (79%), Netherlands (43%), India (43%), and Germany (36%) since 2010. Executed with honest intent and a long-term view, Purpose provides distinct competitive advantage.